This is the longest weekly list so far, and contains historic moments. Senator Dianne Feinstein released 300 pages of Fusion GPS testimony on the Steele dossier, days after her Republican colleagues had unilaterally issued the committee’s first criminal referral to the FBI, implicating Steele. Trump’s “shithole” countries statement prompted worldwide condemnation and questions of whether he is eroding US moral authority — while concerns about his fitness for office continued to swirl. This week there were innumerable shocking and important developments, including proposed changes to Medicaid, exempting Florida from offshore drilling, and waiving fines for five megabanks, including Deutsche Bank — all of which, in a week of sheer bedlam, got little or no attention. Oprah Winfrey’s historic “a new day is on the horizon” speech at the Golden Globes, which captured the country’s attention Sunday night and prompted speculation of a possible presidential run, was a distant memory by Tuesday. WAPO reported that Trump has made more than 2,000 false or misleading claims in his first 355 days in office — on average, 5.6 claims per day. Contradicting Trump regime talking points, Sebastian Gorka said he was told to cooperate with Fire and Fury author Michael Wolff, but said after meeting him in Reince Priebus’s office he got a bad feeling and did not. Steve Bannon was set to meet with Wolff after him. On Sunday, the same day as the Golden Globes, Trump delayed his “fake news awards” he has teased about on Twitter, adding interest had exceeded his expectations. According to a source, Axios reported Executive Time means TV and Twitter time alone in the residence. Trump schedule also lists 8 am to 11 am as Executive Time in the Oval Office, but most is spent at the residence. Trump also mistakenly linked to the email address of the author of the column, Michael Goodwin, rather than to the article. On Monday, CNN reported in early 2016, before Bannon and Trump became allies, a watchdog group led by Bannon tried to shop anti-Trump research alleging ties between Trump companies and organized crime. On Monday, Trump spokesman Hogan Gidley said the WH is not accepting Bannon’s apology over his attacks on Trump and his family, adding Jared Kushner and Ivanka are “sacrificing” for the nation. On Tuesday, Bannon stepped down as executive chairman of Breitbart over the controversy sparked by this remarks in the Wolff book. NYT reported the departure was forced by his one-time patron, Rebekah Mercer. Cincinnati Enquirer reported that Detroit ICE will proceed with deporting Yancarlos Mendez, a 27 year-old caregiver for a 6-year-old paraplegic boy. ICE says Mendez has overstayed his visit under a visa program. The County Sheriff in Williamson, Texas is investigating a noose found on a campaign sign outside the home of a supporter of Democrat Christine Mann, who is running for Texas’ 31st congressional district. A federal judge in New Jersey lifted a decree dating back to 1982 which had barred the RNC from poll watching and other election day activities. Democrats had cited Sean Spicer’s presence in poll watching activities in their case. Joe Arpaio, the 85 year-old former sheriff with a history of racial profiling and mistreating immigrants, who in Week 41 was pardoned by Trump, announced he will run for the Arizona senate seat vacated by Jeff Flake. On Monday, the Trump regime announced the end of the Temporary Protected Status permits for about 200,000 Salvadorans who have lived in the country since at least 2001, leaving them to face deportation. In Trump’s first year, arrests by ICE are up by 40%. Trump has also slashed the number of refugees accepted into the US to the lowest levels since 1980. Nearly 700,000 are also set to lose protection under DACA. Miami Herald reported Trump’s DHS is considering a new regulation that would prevent H-1B visa extensions for hundreds of thousands of workers, predominantly from India, who work in the technology field. On Tuesday, a federal judge ruled that while a legal challenge to ending the Obama-era DACA program proceeds, protections against deportation for the 690,000 Dreamers must stay in place. Also in the ruling, the judge said anyone who has DACA protection expiring can renew it. On Wednesday, the WH responded, calling the injunction “outrageous.” The Trump regime vowed to fight the ruling. Deyshia Hargrave, a Louisiana teacher, was handcuffed and forcibly removed from a school board meeting after questioning the superintendent’s pay raise. Hundreds of teachers, parents and officials rallied in her support. WAPO reported Renee Thole, a white social studies teacher in Ohio, told a 13 year-old black student that he would be lynched if he didn’t stop talking in class. Thole was reprimanded and sent for cultural sensitivity training. A panel of federal judges struck down North Carolina’s congressional map saying it unconstitutionally gerrymandered, and demanded state Republicans redraw lines ahead of midterms. This is a first by federal courts. On Thursday, the Trump regime issued guidelines to states which will require people to work or prepare for jobs in order to receive Medicaid, the first time this requirement would exist in Medicaid’s half-century history. IBT reported during the Christmas holiday, the Trump regime quietly waived part of the punishment for five megabanks who were convicted and fined for manipulating global interest rates, including Deutsche Bank. NYT reported that the blueprint for what has become Trump’s energy policy looks similar to confidential memo by Robert Murray, CEO of coal company Murray Energy, who donated $300K to Trump’s inauguration. On Tuesday, the Trump regime granted an exception to the state of Florida for the announced plan to open offshore drilling off the US coastline in Week 60. Observers noted Trump’s Mar-a-Lago is located in Florida. On Monday, Trump renominated K.T. McFarland for ambassador to Singapore. In Week 56, NYT reported on McFarland’s emails revealing she had knowledge of a crucial email exchange between Michael Flynn and Sergey Kislyak. On Monday, Trump renominated 21 judicial nominees, including two rated “not qualified” to be federal judges by the American Bar Association. WSJ reported Robert Weaver, Trump’s nominee to lead the troubled Indian Health Service, misrepresented his leadership roles and work experience at a Missouri hospital to a Senate sub-committee. On Monday, Trump nominated Marie Royce, wife of Republican Rep. Ed Royce from California, to a senior State Department role. Also on Monday, Rep. Royce said he would retire. Royce became the eighth Republican committee chair to not seek re-election in November 2018. On Tuesday, another California congressman, conservative attack dog Darrell Issa said he would not seek re-election. Trump’s unpopularity continues to weigh on Republicans, and many expect a blue wave in midterms. Second lady Karen Pence’s chief of staff, Kristan King Nevins, resigned. On Tuesday, CNN reported WH aides have been told to decide by the end of January if they plan to stay on through the November midterms. Chief of staff John Kelly is finding it difficult to replace top advisors who have already left. People in the WH say exhaustion for employees is magnified by the chaos and unpredictability under Trump. Potential and existing employees are also concerned about the ongoing Mueller probe and legal fees. Don McGahn, the WH counsel, and HR McMaster, Trump’s second NSA, are considering resigning. McGahn’s wife Shannon resigned from the Treasury Department in Week 60. Bloomberg reported Geoffrey Berman, Trump’s interim Southern District of NY AG, has longstanding business ties to Deutsche Bank starting when he worked for law firm Greenberg Traurig, and continuing until recently. A decade ago, Berman was brought in by Robert Khuzami, then general counsel for Deutsche’s US operations. Now, Berman has tapped Khuzami to be his deputy. Kirsten Gillibrand said she will use her “blue-slip,” which gives senators a way to block confirmation of nominees in their state, to block Berman, citing his conflicts of interest with Trump, including the fact that Trump interviewed him as part of the nomination process. On Monday, NBC News reported initial talks between Trump’s lawyers and Mueller are underway for Trump to be interviewed. A range of possibilities from handwritten responses to a formal sit-down are being discussed. Trump’s lawyers are seeking clarification on whether Trump would be interviewed by Mueller, legal standard, location, topics, and duration. Trump’s lawyers are trying to avoid an in-person interview. On Wednesday, at a press conference with Norwegian PM Erna Solberg, Trump again complained about Hillary Clinton and the FBI, saying “A lot of people looked on that as being a very serious breach, and it really was,” referring to a 2016 interview Clinton had with the FBI regarding her email server. Also at the press conference, Trump lauded the delivery of F-52s to Norway. No such plane exists, except in a popular video game. On Friday, Bloomberg reported despite Trump’s statement, his lawyers and Mueller’s team are continuing talks about an interview. The next call will be next week, and working out the details could take several weeks. BuzzFeed reported the biography for Joseph Mifsud, the professor who met with George Papadopoulos and told him the Russians had dirt on Hillary, was removed from the website at the university in Italy where works. BuzzFeed reported the Trump regime is seeking a broad reset with Russia in 2018, setting up numerous high-level engagements with the Russian government, the first such meetings since the Ukraine crisis in 2013. Daily Beast reported in February 2017, Kevin Harrington, a senior official for strategic planning on Trump’s NSC, proposed withdrawing US forces Eastern Europe as an overture to Putin. 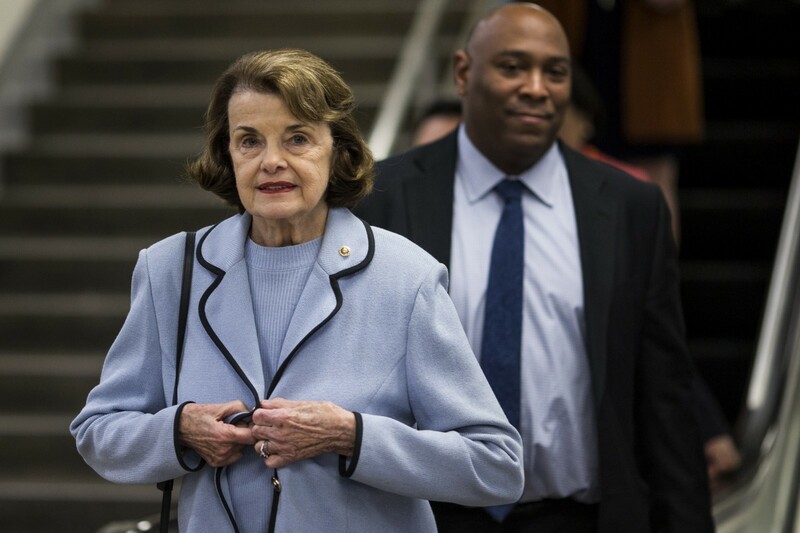 On Tuesday, Sen. Dianne Feinstein, ranking member of the Senate Judiciary Committee released the senate testimony of Glenn Simpson, founder of Fusion GPS, breaking with her Republican colleague, committee chair Chuck Grassley. The release reflects a growing partisan divide: in Week 60, Sens. Grassley and Lindsey Graham made the committee’s first criminal referral against Steele without consulting Democrats, including Feinstein, the ranking member. Feinstein also noted, “to my knowledge, there is not a single fact that’s proven to be incorrect” in the dossier. According to Simpson’s testimony, Steele was concerned that Trump could be blackmailed by the Russians over an alleged 2013 sexual escapade believed to have been recorded at the Ritz Carlton hotel in Moscow. Based on the transcript, when the FBI met with Steele in September 2016 for a full debriefing in Rome, the bureau already knew about possible collusion between the Trump campaign and Russia. Per the transcript, and as reported by the NYT in Week 60, an Australian diplomat had informed the FBI about his conversation with Papadopoulos regarding Hillary’s hacked emails, and an investigation was opened. Republicans have in recent weeks sought to discredit the Trump-Russia probe by diminishing the credibility of Steele and the dossier, thought to be the original source of the FBI investigation. This appears to be false. Steele ended contact with the FBI after a front-page story at the NYT on October 31, 2016 said the FBI found no conclusive link between Trump and Russia. This was inaccurate reporting — the FBI’s counterintelligence investigation began in July 2016. Simpson testified when he started doing his research on Trump, he was struck by Trump’s many connections to people linked to Russian organized crime, and his frequent travel to Russia. At the time Simpson was working with Steele, he was also working at a New York law firm with Natalia Veselnitskaya and Rinat Akhmetshin on another case; but Simpson was not aware at the time of the June 9 Trump Tower meeting. Simpson also testified that based on his research, Trump is not as rich as he appears to be, saying Trump has a lot of questionable business entanglements which should be investigated. On Tuesday, Michael Cohen filed lawsuit in federal court against Fusion GPS and BuzzFeed, claiming the dossier contains “false and defamatory” allegations that harmed his reputation and business interests. Politico reported Republicans are ramping up scrutiny of DOJ and FBI officials’ contacts with the media. Experts raised concern that the effort is meant to intimidate officials and chill investigative reporting. On Wednesday, Sen. Ben Cardin released a Senate Foreign Relations Committee Democratic staff report detailing two decades of Putin’s attacks on democratic institutions, universal values, and the rule of law across Europe and the US. The report includes 30 recommendations, and says that the US remains vulnerable to Russia’s aggressive and sophisticated malign influence operations without unequivocal leadership from Trump. On Friday, the Des Moines Register reported Grassley faced relentless questioning about Trump’s fitness for office and his own handling of the Russia investigation at a rural town meeting Friday morning. WAPO reported that Mueller’s team added a veteran cyber prosecutor to his team in early November. Ryan Dickey was assigned from the DOJ’s computer crime and intellectual-property section. Russian oligarch Oleg Deripaska again sued Paul Manafort and Rick Gates in a NY court for more than $25 million in damages over a failed business deal. The new suit cites Manafort and Gates’ recent indictments in the Mueller probe. On Thursday, Daily Beast reported Bannon hired attorney Bill Burck of the firm Quinn Emanuel as he prepares to be questioned by the House Intelligence Committee in the Trump-Russia probe, possibly next week. Burck also represents McGahn and Priebus. Experts say having three Trump insiders represented by the same attorney may irk investigators over concern they are coordinating their stories. Politico reported Mueller is seeking a May 14 trial date for Manafort and Gates. In a new report, the special counsel says they’ve produced 590k electronic items, considerable more than the 400k last reported. AP reported hacking group Fancy Bear, who infiltrated the 2016 US election, is now laying the groundwork for an espionage campaign against the US Senate, according to a cybersecurity firm report issued Friday. US intelligence believes the Russia’s military intelligence service is behind Fancy Bear’s activities. Several other democracies and the upcoming Olympics, from which Russia has been excluded, have also been targeted. Despite Trump’s pledge not to expand overseas while in office, Trump Towers made its debut in north India — 250 ultra luxury residences under a brand license from the Trump Organization. In a letter, Democrats on the House Oversight Committee called on the committee’s chair to subpoena the Trump Organization for documents detailing payments from foreign governments received during 2017. BuzzFeed reported that since the 1980s, Trump has sold more than 1,300 condos to shell companies, and that the purchases were made without a mortgage — signals of possible money laundering per the Treasury Department. BuzzFeed’s analysis revealed 21% of the 6,400 condos sold by Trump in the US, yielding $1.5 billion in sales, fit this pattern. Sales of these type surged in the late 2000s and early 2010s, when Trump was in financial trouble. At the Trump SoHo, 77% of condo sales were to shell companies that paid cash. In The Weekly List, Felix Sater, who has ties to Russian organized crime and is under scrutiny by Mueller, worked on the Trump SoHo deal. NYT reported that Kushner Companies’ financial ties to Israel have deepened with Kushner’s role in the Trump regime. Menora Mivtachim, Israel’s largest financial institutions, recently invested $30 million in a Kushner Cos. apartment complex in Maryland. In addition to Menora transaction, Kushner Cos. also has deals with Israel’s wealthiest families and a large Israeli bank that is the subject of a US criminal investigation. Abbe D. Lowell, Kushner’s attorney, said Kushner is not involved with the deals. WSJ reported the Securities and Exchange Commission launched a probe into the Kushner Companies’ use of the EB-5 visa program in May 2017. The probe is in collaboration with the Brooklyn’s US attorney’s office, which also subpoenaed the company. On Monday, the five member Federal Energy Regulatory Commission, four of whom were appointed by Trump, unanimously rejected Energy Secretary Perry’s proposal to prop up nuclear and coal power plants in competitive electricity markets. WSJ reported as South Korea and North Korea resume diplomacy and prepare to meet, Trump is considering a limited strike against North Korea, known as a “bloody nose” strategy. Rex Tillerson and Jim Mattis are trying to hold him back. On Tuesday, North Korea agreed to send athletes to the February Winter Olympics in South Korea, a symbolic breakthrough. In Week 56, press secretary Sarah Huckabee Sanders and UN ambassador Nikki Haley said it was uncertain if the US would attend. The Guardian reported that according to a draft of a policy review, the Trump regime plans to loosen constraints on the use of nuclear weapons and develop more usable nuclear warheads. UK media reported Trump canceled his planned trip to the UK to open the new US embassy in London, amid fears he won’t be welcome. Trump is also unhappy about the lack of “bells and whistles,” and not being able to meet the Queen. Late night Thursday, Trump tweeted the reason he canceled the trip is because Obama “sold perhaps the best located and finest embassy in London for “peanuts.”” The new location was actually picked under George W. Bush. At his first press conference, Trump’s ambassador to the Netherlands was peppered with questions about false claims he made in 2015 about chaos that the “Islamic movement” to the country. Ambassador Peter Hoekstra couldn’t answer. On Tuesday, seemingly to refute Wolff’s book accusations of his being mentally unfit, Trump hosted a televised negotiation meeting on DACA which included a bipartisan group of lawmakers. When asked, Trump said, contrary to his prior statements, he would support a “clean” bill protecting dreamers, and take up comprehensive immigration reform later. GOP Rep. Kevin McCarthy then corrected him. On Tuesday, Rep. Brendan Boyle introduced the “Stable Genius Act” which would require presidential candidates to take a mental health exam. Trump also complained to reporters about their coverage of his DACA meeting Tuesday, saying news anchors were complimentary — even sending Trump letters telling him so — before network bosses weighed in. On Thursday at 7:33 am, ahead of a planned House vote, Trump ripped the Federal Intelligence Surveillance Act , which his own WH had publicly supported the day before, tweeting the bill might be have been used to spy on his campaign. NBC News reported that in between the tweets, Kelly raced to Trump to explain the situation and compose the second tweet. Kelly then rushed to Capitol Hill to ensure wavering lawmakers. The bills passed handily. Newsweek reported that Trump speaks at a fourth-grade level, the worst vocabulary of any modern US leader according to Factbase, which analyzed the first 30,000 words each leader spoke while in office. A Quinnipiac poll grading Trump’s first year in office found 39% gave him an “F,”17% a “D,” 11% a “C,” 16% a “B,” and 16% an “A.” The poll also found 69–28 he is not level-headed, and 57–40 he is not fit to serve. WAPO reported a Koch-backed group called The Libre Institute is launching new outreach programs targeting hundreds-of-thousands of Puerto Ricans moving to Florida and other states, ahead of the 2018 election. A year after Trump and Pence touted Carrier Corp in their plan to save American jobs, the company announced new layoffs at its factory in Indianapolis, bringing the headcount there of workers down from 1,600 to 1,100. NBC News reported, based on information obtained through the FOIA, 40 federal workplace safety inspectors in OSHA have departed since Trump took office, and as of October 2, 2017, none had been replaced. The meeting was originally to discuss a bipartisan immigration deal with Sen. Richard Durbin and Lindsey Graham. Trump also invited GOP immigration hardliners Sens. Tom Cotton and David Perdue, and Reps. Kevin McCarthy, Bob Goodlatte, and Mario Díaz-Balart. On Friday morning, Trump tweeting a vague denial saying he did not use the term “shithole,” but acknowledged he used “tough” language during the negotiations. After Trump signed the proclamation and was leaving the room, reporter April Ryan shouted the question, “Mr. President, are you a racist?” Trump did not respond. Two of the Republicans senators in the room, Cotton and Perdue, said in a statement they “do not recall” Trump saying those comments specifically. Rep. Cedric Richmond, chair of the Congressional Black Caucus, and Rep. Jerrold Nadler, ranking member of the House Judiciary Committee, announced they will introduce a censure resolution next week for Trump’s remarks. On Friday, WSJ reported Trump lawyer Michael Cohen arranged a $130K payment to Stephanie Clifford, an adult-film star, in October 2016 to silence her from speaking about her sexual encounter with Trump. Clifford, whose stage name is Stormy Daniels, has privately alleged the encounter took place at a July 2006 celebrity golf tournament in Lake Tahoe, months after Melania had given birth to Barron Trump. Clifford was set to go on “Good Morning America” in the fall of 2016 to discuss her relationship with Trump, but the National Enquirer agreed to pay her $150K for her story — which the paper then buried. On Saturday, residents of Hawaii received an emergency alert on their mobile devices and television screens, warning of a “ballistic missile threat inbound” and telling them to “seek immediate shelter.” The Hawaii Emergency Management Agency said the alert was sent in error. THE LIST — weeks 1–52 of The Weekly List are coming out as a book! You can pre-order your copy by clicking here. The Weekly List website is live! Find resources, videos and more. Sen. Dianne Feinstein (D-CA) unilaterally made public the transcript of the testimony of Fusion GPS, the firm behind the Steele dossier.